Finally, the new science cookies are done! It is tough to keep a 2 year old occupied long enough to work on cookies. I need some sort of giant hamster-ball for her to run around in when I need a few minutes to work. 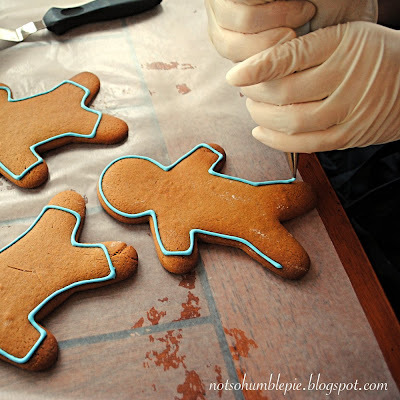 Anyway, this batch of science cookies are gingerbread men (or women, I didn't check) decked out in microbiology containment suits. These cookies laugh in the face of ebola and crimean-Congo hemorrhagic fever! They are ready for any microbe or virus you might throw at them, just don't sniff the insides of their suits. These are made with Martha Stewart's gingerbread cutout dough, the recipe can be found here (LINK) and my standard royal icing found here (LINK). The cookies are tinted with three Americolor gels: Navy Blue, Gold and Super Black. It takes a lot of baking to use up this hefty batch of gingerbread dough. Eh... Why are those eggs are sitting there? Piping my outlines before flooding. My hands look slightly less rubbery without latex gloves on. 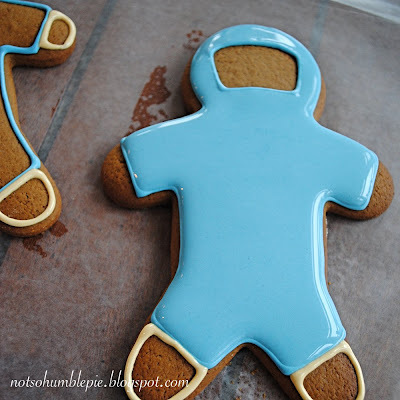 Completed containment suit cookies! Okay, the knees look a little wonky. Trying to ice cookies after a 3rd cup of coffee wasn't such a hot idea. Do they look a little paranoid to you? Bonus points for the Marathon Man reference. I hear you about the 2 year old, but don't put her in the hamster ball quite yet (wait until she's fourteen). Right now is a time you can never recover, and you can always make cookies after bedtime if it's too much work to be a mom and a blogger at the same time. I hope that you will be able to put a step-stool at the other end of the counter and give her cookies to decorate too, one at a time. I started my two-year-old in Seattle with this sort of thing, and it reaaaaalllllly pays off when they get older. She could open a pre-cracked egg "like a book, Mama!" into a bowl for me at 2. Made things from scratch at 8 reading recipes unassisted. Cooked dinners at 10. Now teaching her little girl. GO for it with your kiddo! I want to see some of her work on these pages! Fabulous ideas! i am saving some of these to give my man (41 years old - but very in touch with his inner child) an interesting birthday treat! Amazing... can't stop laughing! You've got such a great imagination... and I can even make them, I've got such a cutter. The little humble likes to roll out playdough with her rolling pin and cutters at the counter with me. Unfortunately there isn't a kid-safe version of royal icing and that is what she really wants (and goes for). I've given it to her, but she is a terror with it. A cement hardened, crusty terror. She will learn to cook, of course. After all, someone needs to take over all this work for me. I should post photos of the 'help' she provided for my circuit board cookies. That is brilliant, I'm amazed! Fantastic! I love your cookies and am so impressed with your icing techniques. You must have a lot of patience. Well done. I love the men!!! How well you do icing... they are perfect... squalling 2 year old or not! These are just too cute. Love them. Congratulations on your great creation. I've been watching your blog for a little while now and you never cease to admaze me. You crack me up and I love your work. I think these are way high on the awesome scale. You even managed to make them look nervous. That's artistry. You totally need a Gordon Freeman from Half Life cookie. I must confess. I am about to turn 40, and I am a cookie-a-holic. I most definitely am going to have to try baking these. These are the most adorable cookies I've ever seen! Very Clever! I'm inspired to bake a batch of my own! New fan, and just wanted to let you know to keep up the amazing work! These are adorable! Good Job! You are so creative! My son said, "Wow....cool!" As an epidemiologist, I say these are absolutely fab! Regaurding the 2 yr old, I suggest Sprout! My kid has been addicted to this channel for about a year and its educational. I hate using the t.v. as a "babysitter" but when you need just 30 min for a shower or mommy time, it helps. If only it was that easy! My daughter seems to be immune to the TV's pull. The only thing that keeps her occupied for more than 5 minutes at this age are pens. Real pens. And I've already learned what happens when she finds one of those and runs off unsupervised. I've been adjusting to evening showers when Daddy is home. Mmmm... morning showers. Someday... Someday. Ooh, Bridget from Bake at 350! I've always loved your cookies! Not a spacesuit, though it does look a little like NASA flight suits. This suit protects the wearer from pathogens and makes them look extremely attractive. Few can resist the big puffy blue moon-man/woman look. They are typically found in higher level bio-safety laboratories. Smart, funny, awesome designer - basically everything I'm not. Glad to find your site through Serious Eats! These are so so so cool!! I find myself coming back over and over again to feed my brain and tease my stomach. Seriously. What was I thinking coming right before lunch? Yes I do realize that they are containment suits, however I was thinking of the aliens coming to place orders for your cookies in your next post. Sorry, just my sence of humor. Ms.Humble, I am making these for my fiancee's graduation from University as a mechanical engineer. He's going to love that I found a way to combine his 2 hobbies, science and cookies. So cool! And perfect for an icing pig!! !